Kerala Ayurvedic Massage, known as the Abhyanga or Abhyangam, is one of the most important dincharyas (daily regimen) mentioned in the classics for achieving good health and longevity. It includes a full body massage done using herbal oils that have several health benefits. Experts believe that many of the prevalent modern-day massage techniques are the modified forms of Abhyangam. 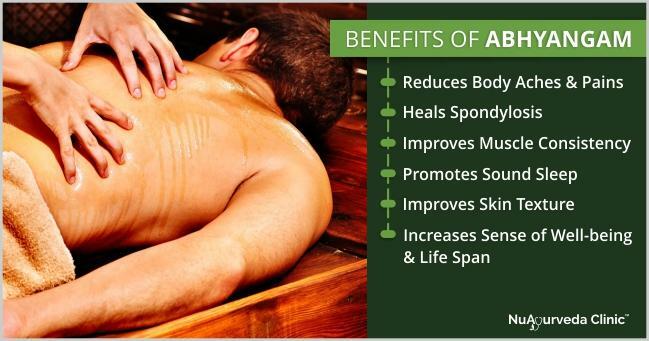 The health benefits of Abhyangham- Kerala massage are mentioned in the Ancient Ayurvedic text Ashtanga Hridaya. It is believed to prevent Ageing, reduce Fatigue, and also diminish the effects of aggravated Vata Dosha. How is Kerala Ayurvedic Massage Performed? Abhyangam can be performed in several classical positions. At NuAyurveda, it is done in 7 different classical positions with long flowing strokes. Some Ayurvedic centres perform it in 4 positions. The number of strokes used and amount of pressure applied during massage varies based on the individual’s requirements and ‘Prakriti.’ The herbal oil used for it is customised as per the patient’s Prakriti and presenting conditions. Ayurvedic Massage can be performed as a stand-alone therapy or as a precursor to other therapy regimen; it can be performed by a single therapist or by two therapists working in synchronisation. Get an Ayurvedic Full Massage done from experienced therapists. What Are the Types of Ayurvedic Massage? Ayurvedic massages use synchronised motions to stimulate nerve endings to increase blood circulation, thereby channelising early elimination of toxins from the body. The herbs in the medicated oils rejuvenate the tissue and play a vital role in the elimination of toxins and bring a feeling of wellbeing. The lukewarm herbal oil used in Ayurvedic massage stimulates nerve endings thereby improving peripheral blood circulation. The specific long flowing strokes improve the lymphatic flow and promote early elimination of toxins from the body. Sarvanga Abhyangam: It is performed on the entire body. Several medicated oils and ghrits are used in this curative and preventive therapy. Sarvanga Abhyangam is done by more than one therapist by applying warm oils all over the patient’s body in seven different positions that are- sitting, lying on back, right lateral, lying on stomach, left lateral, lying on the back, sitting. This Ayurvedic massage involves the application of the right amount of pressure and synchronised circular movements to provide you with a number of health benefits. Sarvanga Abhyangam relaxes your whole body and alleviates the pain in the muscles. It improves blood circulation and helps you recover faster. Moreover, it strengthens your immune system to keep you shielded from numerous diseases. Ekanga Abhyangam is a customised version of the whole body Ayurvedic massage. It is done only on the affected part of the body. The patient is massaged using the warm oils followed by the steam exposure to the affected part. Ekanga Abhyangam is highly effective in relieving pain and promoting the tissue regeneration. It also tones up the body muscles and helps them in strengthening in order to speed up the recovery of the affected part of the body. Padabhyangam is the Ayurvedic foot massage, which aims to improve the functioning of all the organs of the body by stimulating different nerve endings present in the foot. It is performed by using specialised Ayurvedic oils and precise hand movements to revitalise the tired feet. Padabhyangam effectively reduces swelling in the lower leg and restores health by improving the blood circulation. It also boosts fertility and helps you eliminate health conditions such as Nervousness and Insomnia. This Ayurvedic massage plays an excellent role in preventing Cramps and Dryness as well. Improves blood circulation and facilitates the removal of toxins from the tissues. Reduces muscle Stiffness and Pain. Lubricates the joints and thus reduces Pain and Inflammation of joints. Abhyangam also reduces Stiffness, Tightness, Spasm in the muscle and increases the blood circulation to the muscle. Increases mental relaxation and promotes better sleep. Nourishes the skin and improves its texture. Which Health Conditions Can Be Managed With Regular Ayurvedic Massage? It is also known to be beneficial in the management of mental conditions such as Anxiety, Depression, and Insomnia. A daily full body Abhyangam acts as a powerful recharger and rejuvenator of mind and body. Where Should You Take Ayurvedic Massage And What Is The Cost? Ayurvedic Massage is one of the most popular Ayurvedic therapies and many Ayurvedic clinics or centers around the city offer it. However, to achieve maximum benefits with the best massage therapy, make sure to visit a professional Ayurvedic center. Ayurvedic treatments are customised based on every individual’s health needs. Please meet our doctors at the clinic to know the price of therapy.